Started the year off under cover, giving some protection from the very cold weather we had. 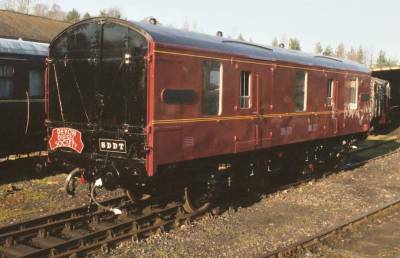 In January the loco had it's battery levels checked and all were in good heath with only a small amount of topping up required. The exhauster and traction motor blower motors were inspected. Checks for earth faults and brush gear condition were made and all were found to be in good order. The compressor had it's oil changed on Sunday 26th Jan, and a nice white oil mess it was. The compressor will need some maintenance done on it in the near future. The problem with the anti-slip button (it blows the main control fuse) was looked into on Sunday 16th March, and it may be a wire going to earth as the EP valve would seem to be in working order. More testing will be done in the coming months. And finally, the defective vacuum gauge was changed on the last Sunday of the month. The feed valve which allows air to the drivers brake valves in the cab, was removed on Sunday 19th Jan and checked out. This valve would blow when the engine was shut down. A fine mesh air filter was cleaned out and the inside of the valve blown through and the refitted to the loco. This valve is found tucked away outside under the cab floor. The loco was brought out of winter hibernation on Sunday 16th March and was multiplied up with 110 (nose to nose). One of the jumper cables is not working as it should. The question is, is it the jumper cable (118) or the socket (110)? This will have to wait until the 25 is back in service for more testing. On Sunday 23rd March the loco had it's first trip of the year down the line on a training run for train crew, and signalmen at Bishops Bridge. It was a late end to the day as a broken fishplate delayed things quite a bit. The full time workshop staff started back after the Xmas/New year break and made a start on finishing off the settling tanks for the loco. By the end of January the tanks were finished, painted and the insides cleaned out of dirt. By the end of day on Sunday 9th Feb. both tanks were reunited with the radiators and on the following Sunday (16th) they were craned back in the loco. This took most of the day. Shunting the loco out started about 10.00 and by dinner time the radiators and tanks were back in place. The fan unit and the two roof panels followed after dinner. Once these were secured the shunting started again to put the 25 back in the running shed, finishing about 17.00. Painting has still been going on when the weather permits, but now the roof sections are back on a heater can be placed inside to help out with this. The next weekend saw the power unit cleaned down and the walkway panels around the power unit lifted and cleaned off. Whilst the panels were up the underneath was cleaned out. One slight hiccup with the new tanks has been the six studs that hold on the tank filler/drain valves are not studs but bolts. By dinner time on Sunday 9th March the cooling system was holding water with no leaks. This was after two or three small teaks were sorted out. On the following Sunday 16th, and after some charging of the batteries the start button was pressed. With one puff of smoke the exhaust cleared and the engine was ticking over, on five cylinders not six. The injector was removed and tested during the week with no fault found. It was refitted at the end of the week and the engine started, but it was still the same. So it looks as if the pump may have to be remove for testing. An air leak in No.1 cab has been fixed. The pipe was removed and brazed up. 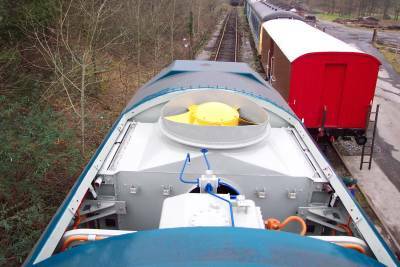 A test of the braking system found that the loco brake in No.1 cab was not working. It would seem that the double check valve was stuck. It was removed and cleaned then refitted. 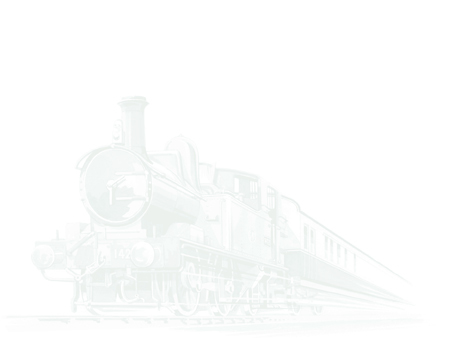 This valve works between the two cabs and it allows air from the loco brake valve in the cabs to the relay valve. The brake valve that has the greater pressure, is the one that operates the relay valve. On Sunday 23rd the last parts were refitted to the loco, namely the radiator grills, so the loco is now back in one piece. Also the loco brakes are once again working from both cabs. On the last Sunday of the month the fuel pump was removed and taken into a firm on Marsh Barton Industrial Estate (Exeter) on the Monday for them to give the pump the once over. A set of new batteries have been ordered and should be with us soon. Awaiting repairs to a coolant leak around the water pump. The last saloon window was refitted by the end of January. This only leaves the Totnes end cab windows to sort out. Now that the big saloon has had all it's windows sorted out attention has now turning to the floor and by mid February the old lino was removed. This big saloon was used as a work area, but this has moved to the CCT (the old blue one). The wood for the ceiling has arrived and this will be the next job to done once the new work area is fully operational. In service, but only just! Some drivers are not disposing the loco as they should, with the battery and pilot switch being found left in. This will drain the batteries over time and then it will not start. 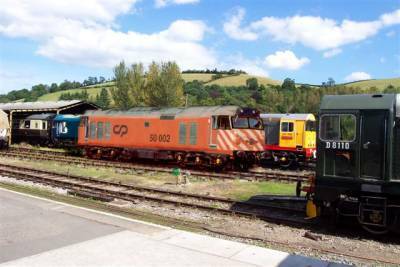 This loco is now owned by the South Devon Railway Trust. No change from last time, apart from seeing the light of day at the start of February for a shunt to take place. 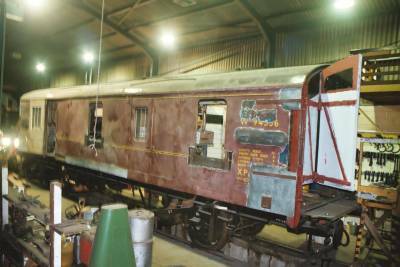 Sunday 12th January saw the loco placed in the workshop ready for it's connecting rod bush overhaul and new cab windows. 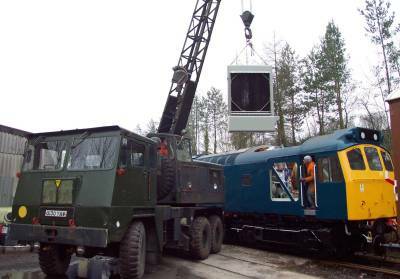 By the end of January the loco had part of the cab roof removed (sun roof! ), along with the front radiator grill and was being rubbed down for painting, also the connecting rod were removed. Later in the month the rotten metal at the base of the cab was cut away along with a piece at the edge of the roof. By mid February the roof section had been replaced (no sun roof! ) along with the radiator grill after cleaning and painting. By the last weekend of February all the welding was completed and filling & painting was the order of the day. By mid March one set of connecting rods had had their crank pins & bushes checked (found to be ok) painted and replaced on the wheels. The set on the opposite side has a crank pin that is slightly oval, so this is having work done on it. The first coat of B.R. green (and yellow ends) was applied in mid March. The cab windows were replaced with new frames 8z seals by an outside manufacturer during the last week of March and they do look 'SUPERB'. MINK W 104700 - Had two new rain strips made to replace the old rotten ones above the doors. 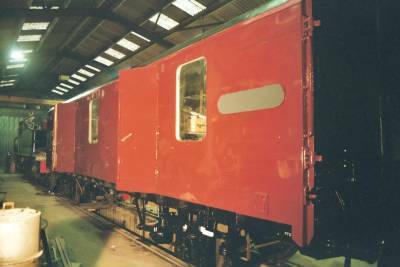 The wagon was placed under cover in mid March for this work to be done, along with a repaint. SST W94556 - On the same day as the 04 entered the workshop, this van left all newly painted and lined out. The whole job start to finish took just 24 days, of which 23 were in the workshop. On the inside some new window frame bottoms were fabricated c/o the DDS carpentry department. It stayed under cover until the lettering was applied in mid February. 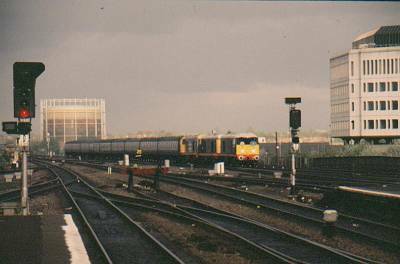 By mid March and it was back up the head shunt at the north end. CCT M94852 - About a quarter of the van has now become the workshop with lights and power points installed. A coat of white paint over this part of the van was applied to help with lighting. MINK `B' W 125814 - This van was locked for the first time on Monday 3rd February as the door fittings were all refitted. This is not before time as a person (unknown) has been inside the van for a candle light meal of chicken and a smoke! With the doors now complete the van now waits it's first trip down the line. The main working Sunday will be the first one on the month, but most Sundays will see someone around if you turn up between 09.00 and 09.30. All help most welcome. FIRST SUNDAYS OF THE MONTH:- 6th April, 4th May, 1st June & 6th July.